The main difference between Kajal and eyeliner is that Kajal can be applied on the waterline of the upper and lower eyelids while eyeliner can only be applied over the eyelids either upper or lower (usually upper). However, it is also possible to use kajal as an eyeliner, but it won’t last long as an eyeliner due to its texture. Kajal and eyeliners are cosmetic products that can make your eyes look prettier and sharper. However, you should use them accordingly in order to avoid side effects and other skin complications. Kajal is an eye makeup product that can outline the waterline of your eyes (both upper and lower) as well as outside. It adds a nice depth, and a sharper look to your eyelids while adding a nice a fuller look to your eyelashes. The term ‘kajal’ comes from the Hindi language, and the same product is known by other names such as Kohl from the Arabic language. Kajal usually contains organic ingredients such as the juice extracted from trees and minerals such as juice of Monasha plant, sandalwood, Manjal karsilanganni, castor oil, ghee, grinding stibnite, etc. Therefore, it has a medicinal value that ensures its safety to apply inside your eyes – inside the eyelids of your eyes. Hence, you can easily put kajal inside the rim or the waterline of your eyelids as it has no harmful effects. Moreover, it has a watery and creamy texture that makes it easy when applying in the lower eyelid as well as in the upper eyelid. Also, it gives a very soothing feeling to your eyes, and people from ancient times used this to protect their eyes from infections and harmful sun rays as well. Therefore, kajal (kohl) is used both by women and men on an everyday basis (especially Arabic men) due to its medicinal value. Following is a small video from a makeup artist on several ways how you can use kajal in your eyes. Some people also use kajal as an eyeliner – using it over the eyelids to sharpen and shape their eyes, However, due to its specific texture, it does not last long when used as an eyeliner. Moreover, since its tip is specifically designed to apply inside the eyelids, using it as an eyeliner is quite difficult and the result becomes rather dissatisfying for many. Eyeliner is an eye makeup product that comes in different types. Its main purpose is to shape your eye line from outside the upper eyelid as well as from the lower eyelid. Therefore, eyeliner plays a major role in the overall makeup since it highlights your eyes from the outside. In other words, eyeliner is applied around the contours of the eyes. Eyeliner helps you to shape and highlight your eyes in several styles such as normal shape style, winged shape style, smokey eyes style, tight eyeliner style, etc. Accordingly, you can use your eyeliner to create different effects by choosing your desired style. This creates a beautiful aesthetic effect in your eyes. Thus, the purpose of eyeliner is to enhance the size and the shape or reshape your eyes according to your wishes. Moreover, eyeliners are usually used by women only, unlike kajal. However, since eyeliner has an aesthetic value, men may also use eyeliners in their performances as well. Eyeliners come in varied forms such as liquid form, pencil form, gel form as well as powder eyeliners. These forms differ in their application as well; therefore, you should be well aware of the most suitable type to use according to your need. Here is a small video that explains how to apply eyeliner easily. Unlike kajal, eyeliner is not made from organic ingredients; therefore, it usually has a harsher texture than kajal. Therefore, using eyeliners as kajal, i.e., using it to apply in your waterlines is not such a healthy practice as eyeliner is made for outside use. It will give you complications and side effects, especially if you are a very sensitive person to allergies. Most use kajal and eyeliners are interchangeably today; however, they shouldn’t be. Kajal is an eye makeup product that can be used to color the upper and lower waterline of your eyelids. On the other hand, eyeliner is an eye makeup product that can be used to define your eyes by coloring your upper and lower eyelids (outside). 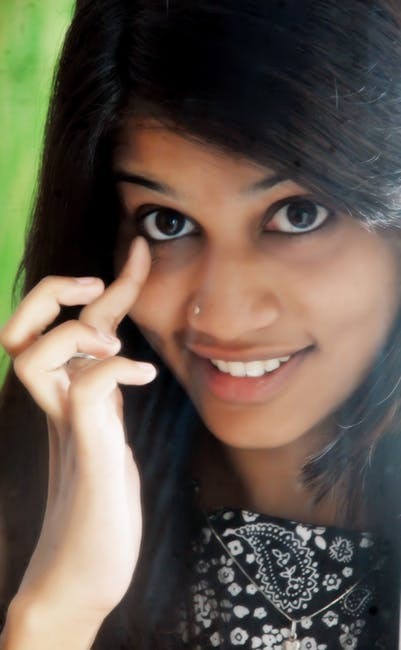 The main difference between Kajal and eyeliner is their use. Kajal is used as a waterline eye makeup in both upper and lower eyelids whereas eyeliner is used as an eyelid makeup to define both the outside of upper and lower eyelids. Moreover, Kajal deepens your waterline while eyeliner enhances the size and shape of your eyes. This is also a major difference between Kajal and eyeliner. Colors available is another difference between Kajal and eyeliner. Kajal is usually black in color with several other primary colors too at present whereas there are varied colors in eyeliners, black being the typical color. 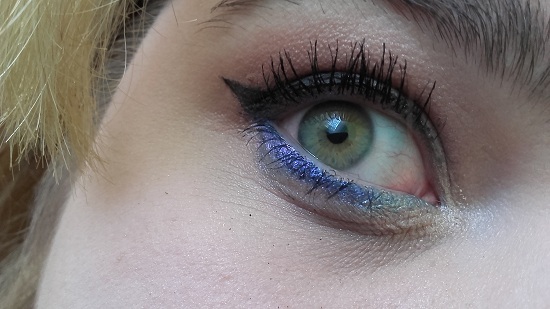 There are other colors as well as glitter eyeliners that will go well with your eye shadow makeup color. Furthermore, Kajal usually comes as a pencil with a watery, creamy texture while eyeliner comes in different types of products such as liquid eyeliner, gel liner, powdery eyeliners, and pencil eyeliner. This is one other difference between Kajal and eyeliner. Kajal and eyeliners are significant cosmetic products for eye makeups. 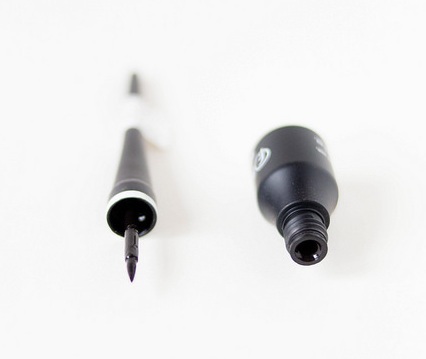 Even though most people use these two interchangeably at present, there is a distinct difference between Kajal and eyeliner as they are two products that serve two purposes. 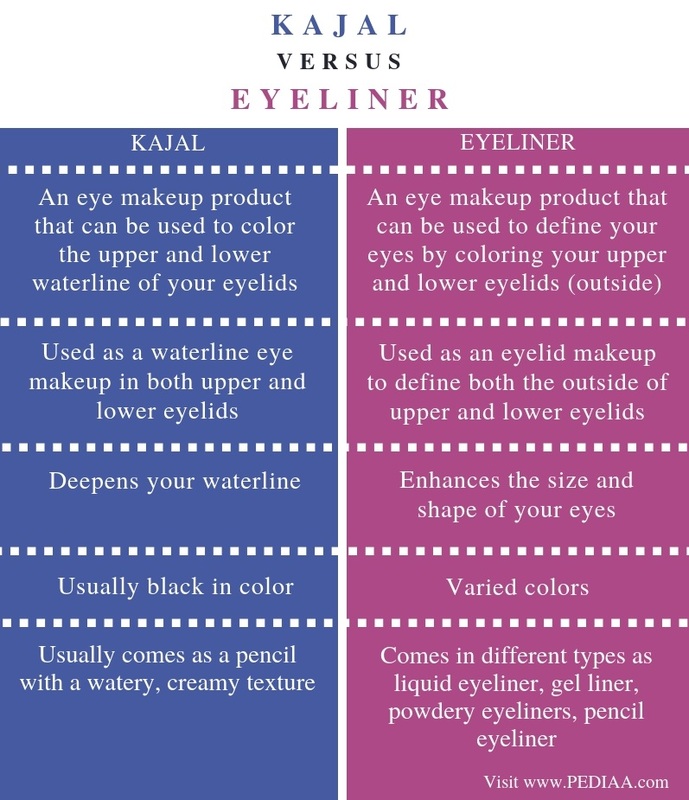 The main difference between Kajal and eyeliner is that kajal can be applied on the waterline of the upper and lower eyelids while eyeliner can only be applied over the eyelids either upper or lower (usually upper).